Cal Har Estates, Lots 17,18,19, Wheat Ridge, Jefferson County, Colorado. Note: measurements by owner and others are approximate. Backyard: fenced with gate to Lutheran Medical Center campus. Rocky Mtn Ditch (Coors Water Resources) was built about 1870, servicing the giant trees. Excluded from sale: red waterfall and yard artwork, workbench-vice, and furnishings and artwork in the house. 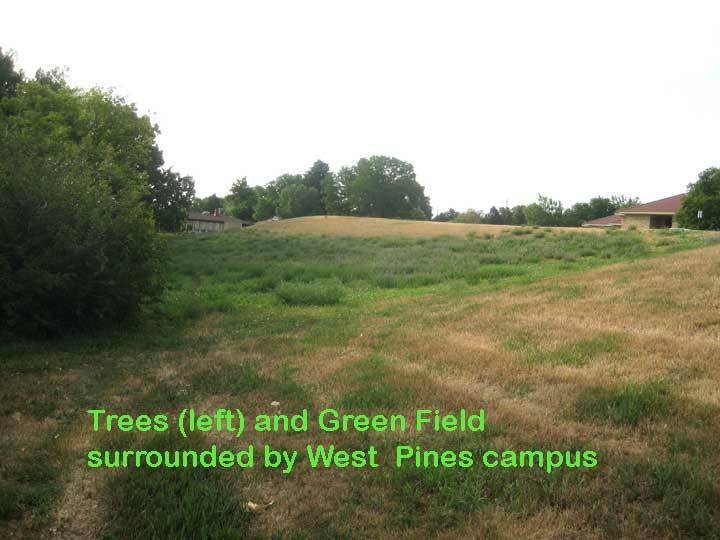 Walking distance (1.5 mi) to Wheat Ridge Sr. High School. Access to Lutheran Hospital campus, Crown Hill Lake and Park. Also has walking path east, along canal to bus stops on Wadsworth Blvd and 32nd Avenue. Appraised in 2006 at $320,000 and appraised Jan 2013 at $325,000. The addition of a walled front courtyard plus finishing the garage interior, changes the dimensions of the "useful area" of the house to 53.5' x 63.2' or 3,380SF. The Rocky Mountain Ditch Company in 2003 abandoned the Lower Ditch on the north side of the Pathway (shown as "Abandoned Waterway") and released their right-of-way in 2006 to all property owners affected. This allows adequate room for adding onto the southside of the house and garage if desired. Click to enlarge the drawing. 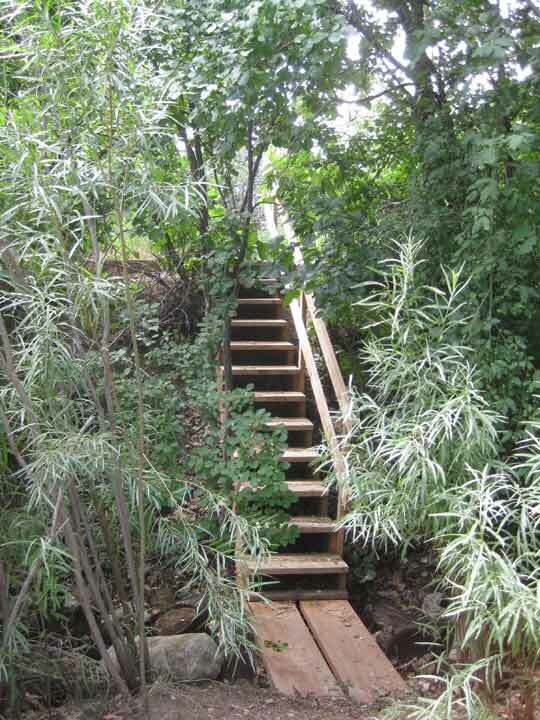 A stairway to the path beside the waterway. As you can see from the aerial photo below, the house is surrounded by barriers that create privacy. 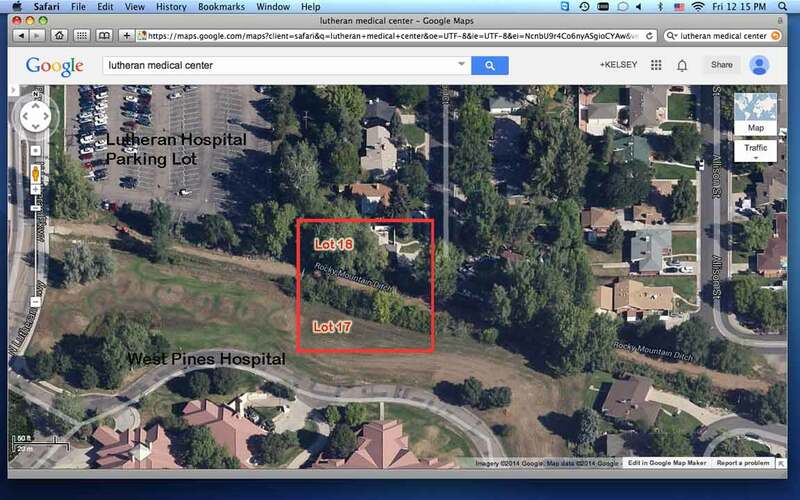 The house is on Lot 18, and the south portion of the property (Lot 17) is a field surrounded by the West Pines Hospital campus. The grass is bordered on the north by a line of trees and bushes along the waterway. It is called the Rocky Mountain Ditch and was built about 1870, supplying properties in Wheat Ridge and northwest Denver. Our property does NOT have water rights, but the ditch does affect the ground water that has nurtured the giant trees for a century. This privacy barrier has always been a feature of the secluded ambience of the home. The field of Lot 17 remains as an undeveloped asset of the property. Perhaps one day in the future, an owner may use imagination to bridge the ditch and place in this field a vegetable & herb garden, an enclosure for pets, an artist's studio, a remote playhouse, or some other creative use. Click to enlarge the aerial photo.